August is officially National Breastfeeding Month in the U.S. Here at Transforming Faces, one of our guiding principles under newborn care is ensuring that breastfeeding support is offered. Here, we look back at Dao’s story of transformation. Dao is a little girl from a Lahu tribal family in rural Thailand. 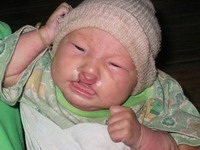 Dao’s parents were very troubled when they realized that she had a cleft lip and palate. They could not afford surgery for Dao with their meager wages, especially with three other young siblings to care for. Dao’s mother soon learned about TF’s project at Chiangrai’s Overbrook Hospital, where all children in need can receive treatment for cleft lip and palate. She and Dao travelled 95 kilometres over rugged terrain, by foot and by car, to reach the centre. Dao was malnourished because of her difficulty nursing. The medical team immediately placed Dao on a special feeding program to boost her weight before surgery. Finally, after much hard work, Dao was healthy enough for surgery in September 2008. Pictured: Dao on her first hospital visit, with her mom, and after her surgery. To the delight of her parents, Dao’s cleft surgery was a success! She is a happy little girl and is growing up very quickly. Dao will continue to visit with the team’s social worker and occupational therapist each month, to ensure that she continues to thrive.